In the second edition of The Star Wars Stacks, we discuss the novel that rebooted the Star Wars EU, Heir to the Empire, written by Timothy Zhan (Publication Date: May 1, 1991). The first portion of this episode is spoiler free and alerts are given before spoilers are discussed. If you haven’t finished the book, or haven’t started it yet, listen to the first half of this episode then pause it when you hear the alert. 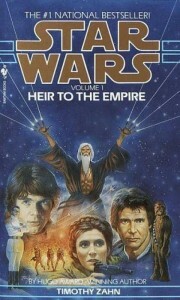 Return to this episode of the Star Wars Stacks when you have finished the novel and are ready to hear the full discussion. One month from now, The Star Wars Stacks will release the next episode: a review of Dark Force Rising by Timothy Zahn.